Bombardier, the world's leading business aircraft manufacturer, is celebrating the 10th anniversary of the entry-into-service of the Global 5000 business jet. The first Global 5000 jet was delivered on April 18, 2005. 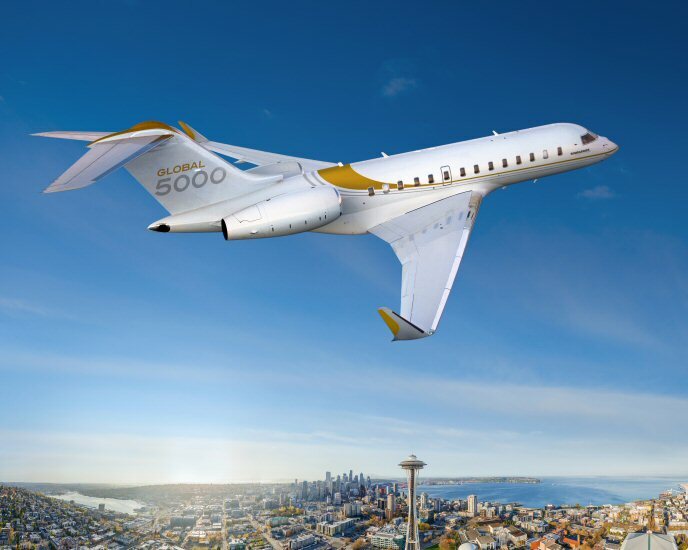 "At its launch, the Global 5000 business jet was the world's fastest entry long range private jet," said Éric Martel, President, Bombardier Business Aircraft. "Not only does this statement still hold true today, but the proven Global 5000 aircraft has since been thoroughly recognized in the industry for its superior performance, short-runway takeoffs, best-in-class avionics, widest cabin and greatest comfort." This aircraft platform in the Global series redefined the market in terms of speed, cabin size, and reliability, earning accolades and the confidence of our large fleet customers. Ten years later, Bombardier Business Aircraft has a strong established fleet of 180 Global 5000 aircraft in service, accumulating more than 300,000 flight hours and 140,000 landings - a testament to its solid, world-class dispatch reliability of 99.8%*. "We are continually improving on the proven and reliable Global 5000 aircraft to make it even better," said Paul Sislian, Vice President and General Manager, Global Programs, Bombardier Business Aircraft. "I am very proud of the track record of the Global 5000 business jets, and I look forward to another decade of historic performances, dependable reliability and unwavering focus on customer satisfaction." Specifically designed to provide a highly productive working environment, the Global 5000 jet provides one of the most spacious cabins among the entry long-range segment aircraft available today. At M 0.89, it flies transcontinental distances faster than any competing aircraft in its segment. Equally important, the Global 5000 business jet's outstanding balanced field performance allows the aircraft to access more airports, bringing passengers closer to their destination. With a range of 5,200 nm (9,630 km) it can connect central North America into non-stop range from continental Europe**. Bombardier, Bombardier Business Aircraft, Bombardier Vision, Global, Global 5000 and The Evolution of Mobility are trademarks of Bombardier Inc. or its subsidiaries. * As of February 28, 2015.